Sarah Rowe is a visual artist from Omaha, NE. She holds a BA in Studio Art from Webster University. Rowe works with a variety of media including canvas, wood, plaster, and hand sewn textiles. 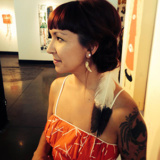 She is of Lakota and Ponca descent and utilizes traditional Native American imagery in her work. Rowe’s work transcends cultural boundaries, creating meaningful cross cultural dialogues. She cofounded Sweatshop Gallery and has exhibited her work nationally.